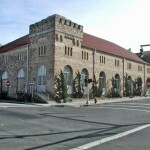 The Durham Armory is located on the corner of Foster and Morgan streets and is available for rentals for your community or private event, whether it is a fundraiser, concert, wedding reception, seminar or family reunion. With a capacity of 585 in the auditorium/ballroom and an additional 314 in the balcony, the Durham Armory offers a large indoor space with lots of flexibility. The amenities include a large commercial kitchen, heating and air conditioning, coatroom, snack bar, tables, chairs, and ample parking surrounding the facility. Call the reservation office at (919) 560-4355, ext. 27202, for availability and rental rates.